Marketing and advertising are evolving arts. Despite the explosive growth of the internet, there is still room for offline innovation in marketing and brand promotion. In recent years, Regtransfers.co.uk has noticed, and encouraged, the increasing use of private vehicle registrations in this context. Whether it is the raising of personal profile, as achieved by Sir Alan Sugar’s famous AMS 1 registration, or the novel promotion of a brand like Theo Paphitis’s stationery chain, Ryman, with the number RYM 4N, personal – or corporate – registrations are big business. An increasing number of companies and entrepreneurs have seen the value of private and corporate vehicle number plates. Some have invested in single, outstanding examples that are guaranteed to make an impact. Others have equipped entire fleets of vehicles with themed or branded registrations. look great in press releases, newspaper articles, TV, etc. Two special omnibus eBooks, featuring organisations who have used personal number plates to identify and promote their businesses. 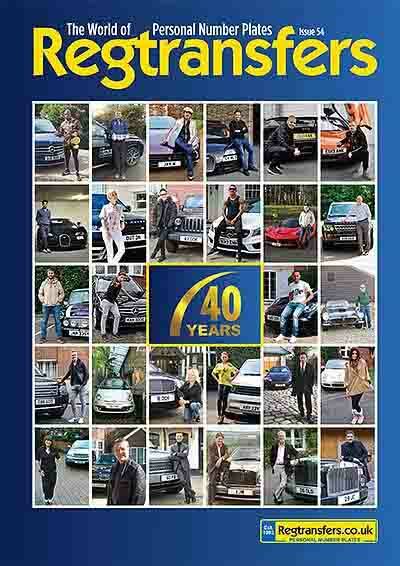 Fantastic FREE magazine stuffed full of number plates information and stories.